On Sunday, the 2nd annual Canon Charity Invitational was held at the picturesque Revere Golf Course at Anthem, southwest of Las Vegas. IT executives, entertainment and sports celebrities and the National Center for Missing and Exploited Children (NCMEC)teamed up to raise over $150,000. On Sunday evening, there was a silent auction held as a fund-raiser, in the Grand Ballroom of the Bellagio Hotel. It will feature baseballs from Sammy Sosa and Johnny Bench. Canon made a separate donation of $100,000 to the NCMEC, to aid its efforts. Congratulations! 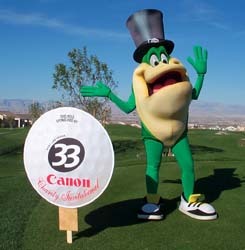 Early Sunday morning participants were greeted by the Warner Brothers mascot "frog". Fairway of the Revere golf course, showing the skyline of Las Vegas in the background. 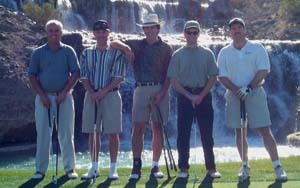 Bob Goen, anchor of Entertainment Tonight and his golfing party. 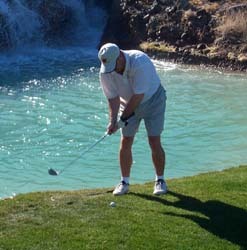 A close shot near the 30 foot waterfall. Copyright © 1999 Rick Smith and Jim Bennett All rights reserved.